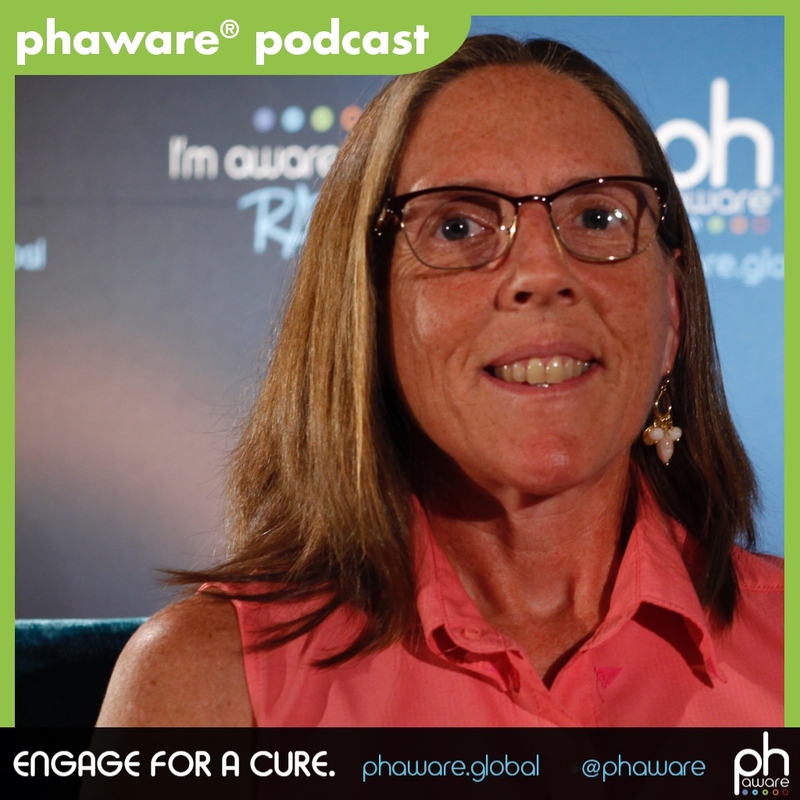 Pulmonary hypertension patient, Kathleen Richardson, discusses exercise, Team PHenomenal Hope and why research is critical. Hi, I'm Kathleen Richardson, and I am a pulmonary hypertension patient. It was after my son was born, my youngest son, he was about two years old, and I was feeling some shortness of breath. It seemed odd to me, but it wasn't significant. I just figured it was after having three children and feeling a little bit short of breath. But then I went to SeaWorld with some friends, and we climbed all the way from the bottom to the top of this stadium, and I was so short of breath I didn't think I was going to recover. But I did. It was short, but I looked around and no one else was breathing as heavy as I was. So I realized there really was something wrong, and I needed to get to the doctor. So I went to the doctor, and it took about six months going to test after test after test. They were coming back normal. The doctor asked me if I'd ever been diagnosed with panic attacks, because I think he was thinking maybe it was in my head. I don't know. That's the message I got anyway. I said, "No, it's not panic attacks," but I did start to question myself at that point and wondered whether I should keep looking because maybe there wasn't anything wrong. It was just in my head. But I did keep pursuing, and they finally did a stress test. When they did that stress test, my blood oxygen saturation dropped significantly. It went down to 78. So then they said, "Yeah, there's something wrong with you." And I said, "Yeah, I kind of figured that." So then I had a few more tests, and then finally had a heart catheterization. After the heart catheterization, the cardiologist said, "There's nothing wrong with your heart. It's got to be something with your lungs. We did notice a little elevation in pressure over here, but not too much." Then a couple days later, he called me back and asked me to come to his office. It was there that he told me he consulted with another cardiologist and said he thought I had pulmonary hypertension. And he didn't really tell me what it was, he just said, "You need to go to a cutting edge hospital. I don't know anything about this disease, and it's important for you to get to somewhere where they know about it." Back then, there were three treatments for pulmonary hypertension. I don't feel like there was a huge hopeful outlook. But over these last 17 years, they've developed 14 treatments for pulmonary hypertension, and it feels so much more hopeful. I feel like awareness has increased. I feel like there's still a lot to be done, but there's a lot more awareness, and I think there's more organizations that reach out to pulmonary hypertension patients. I feel like it's a lot more hopeful now. My life really did not change very much. I thought that it was going to, because when I learned what pulmonary hypertension was, at that time they were saying that the survival rate after diagnosis was like two to eight years average. There was a lot of emotional, psychological things to kind of work through. I had little kids. My youngest was two, my oldest was seven. So just kind of trying to deal with my own mortality really. But I responded very well to the medication that I was put on. I began to exercise. The doctor told me that I could get my heart rate up to 115, and that would still be kind of safe for me. Because above that, I would be doing more harm than good. So I started riding my bike, and I've gotten better in my pulmonary pressure. Dropped down to normal after a few years, and I've stayed real active and gotten involved in Team PHenomenal Hope. Because they started out as cyclists, and that was really exciting for me. So I've been involved with them for now the last four years. I'm on the team as an athlete, and I am a cyclist. But I've now kind of branched off into triathlons. So I've done a couple of sprint tris and I did an Olympic tri, and I'm hoping to do a half Ironman. I have a partner, a #LetMeBeYourLung partner. Haley York is my partner. Pulmonary hypertension awareness is important because we need to get diagnosed early. There are still so many people who go for a long time without getting diagnosed or they get misdiagnosed. So it's really important for doctors to become more aware, medical professionals to become more aware. Because it's still a rare disease, and people need to know about it so they get diagnosed early, get proper treatment early. I would say, really work hard to become knowledgeable about pulmonary hypertension. Get involved in a support group. Follow your doctor's orders. Research and trials is critical, because there's still so much that they don't know about pulmonary hypertension, so much that still needs to be learned. We want a cure. We want to get rid of this whole disease. I'm Kathleen Richardson, and I'm aware that I'm rare.